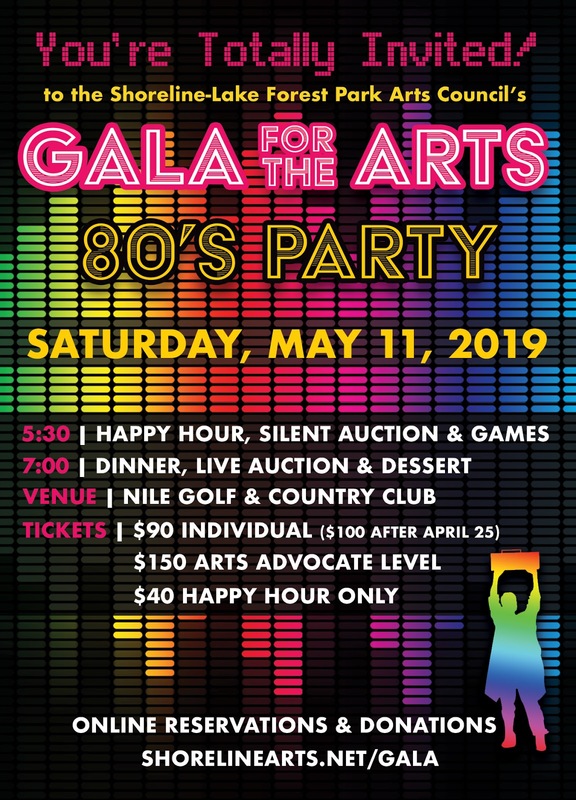 Tickets are on sale now for the Shoreline-Lake Forest Park Arts Council’s Gala for the Arts on May 11 at the Nile Golf and Country Club. The Gala promises to be a fun and entertaining evening celebrating the arts in our community. The Annual Shoreline-Lake Forest Park Arts Council Gala for the Arts is our biggest and most important fundraising event of the year. In honor and celebration of the Arts Council’s 30 year anniversary, this year’s theme is the 1980’s — Like! Totally Tubular!! Fine wine, delicious food, enticing auctions, and wonderful company makes this a “don’t miss” event. As always, Individual Tickets include sit-down dinner and wine throughout the evening. Arts Advocate, our premium level tickets, offers the opportunity for guests to financially support the Arts Council with a tax-deductible donation along with their ticket purchase. Arts Advocates will be recognized in the auction catalog; can enjoy a reserved front row parking spot; a complimentary ticket for one specialty cocktail, and of course dinner and wine. And Happy Hour tickets are for those guests who would like to come and enjoy wine and appetizers during the first half of the event. Happy Hour guests are welcome to stay for the entire evening but these tickets do not include dinner. More information or to purchase tickets/make a donation HERE or contact Tara at events@shorelinearts.net.